The germ-killing door handle glows in action. THE THOUGHT OF touching a door handle in a public restroom is cringe-inducing. It takes just one person who doesn’t wash his or her hands to leave some germs hanging around to get passed on and spread diseases. To nip that possibility in the bud, two teens from Hong Kong figured out a sophisticated and cheap way to make a door handle that disinfects itself automatically. Sum Ming “Simon” Wong (17) and Kin Pong “Michael” Li (18) presented the design of their nifty door handle at the Intel International Science and Engineering Fair on 12 May. The door handle is coated with titanium dioxide, a mineral that kills bacteria and is found in paint and sunscreen. That takes care of preventing bacteria from growing on the surface of the handle, but because titanium dioxide is best at killing bacteria under ultraviolet (UV) light, that’s not the end of the cool design. 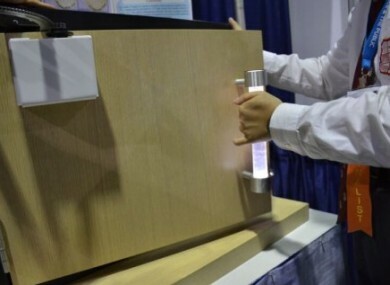 Because door handles aren’t normally bathed in UV light, Wong and Li figured out a way for every bit of their bacteria-fighting handle to get some UV rays: They lit it from inside. The handle itself is a cylinder of clear glass, with a strong light-emitting diode (LED) on one end that shines UV light through the length of the handle. Lit up with UV light, the titanium dioxide can go to work killing bacteria. And there’s more. The LED needs power. To keep the light on, Wong and Li attached a gearbox to the door that converts the motion of the gears from opening and closing the door into electrical power. That powers the LED, so it doesn’t need an outside energy source to work. There seem to be a lot of components to the design, but Wong and Li estimate the self-disinfecting door handle system would cost only about €11.50 to build. Email “This futuristic bathroom door handle has a trick up its sleeve”. Feedback on “This futuristic bathroom door handle has a trick up its sleeve”.